Juxtaposing comparisons with Regina Spektor and Laura Marling against kind words from BBC Cornwall perhaps paints, somewhat immediately, a picture of rural English gentility. 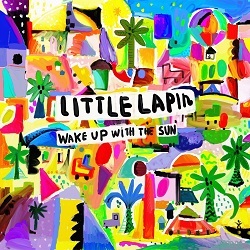 And quaint though this, Little Lapin’s third outing, undoubtedly is… unfortunately, it’s also a touch inconsistent. Delivered with the aid of a strummed acoustic guitar, a smattering of (pretty poorly recorded) bass, a bit of percussion and a very bizarrely mixed guitar solo on Isn’t Life For Living, there is very little to distinguish between the album’s nine songs, all of which are vehicles for the author’s whispy vocals and introspective lyrical musings. Relief comes in the form of three slow and rather lovely songs that really stand out: A Song For Alex, I Told You So and Radio Nocebo (the latter sounds a lot like Throwing Muses at their quietest or something from a Kristen Hersh solo album). Sadly, the quality of these particular songs shines too brightly against the backdrop of the rest of the album, which cannot sustain that same sense of isolated, peculiar, ethereal whimsy. Despite the few all too brief glimpses of brilliance, this undeniably unique and quirky collection of songs is undone by a lack of quality control. The result is an album that cannot quite hold the attention of its audience. Stunning cover art conceals a few lovely songs and a lot of inconsistency.